It sure is looking much like last year at this point. I would probably be further if I hadn't started rewriting stuff. I also made the will and sanity bars animate like I have in my super secret project but it didn't look as good so that was time wasted. Instead I made them simply lerp between a dark and brighter color. I wanted to have skippable animations (namely ranged and area attacks) in this game and so I spent a good while figuring out how to do it. In the end it was quite simple and now works -- for melee at least. 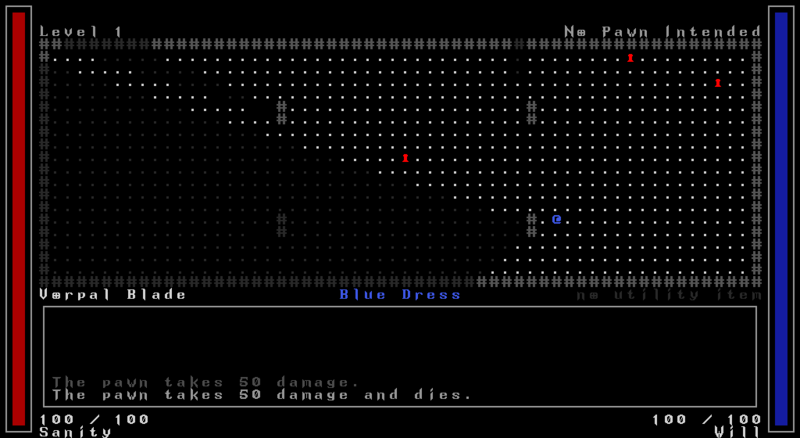 But ranged attacks shouldn't be that much different once I get to implement them. Speaking of ranged attacks, I think I will skip on making proper targeting and projectiles flying through unoccupied trajectories. Coding those is always such a pain. I could copy the code from Drakefire Chasm or Rogue Effect but that is also quite a lot of work since I would need to edit the code to work in this game. I think that I will just a have simple target cycling and projectiles will take shortcuts through walls to hit a target you can see. Tomorrow, I will get at least the pawns act and start working on map gen. I will need more than two types of levels for this game. 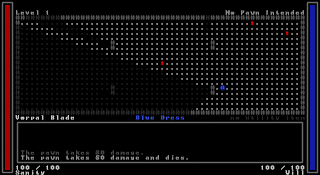 This blog mainly follows the development of Tanthie's roguelike projects. Tanthie is a Finnish roguelike developer who likes cats, listens to symphonic metal, and is annoyed by hay fever every summer. xkcd -- "the only webcomic worth a damn"